A nose for neuroscience: Zen, a golden retriever/lab involved in the study. Photos, above and below, by Helen Berns. An area of the canine brain associated with reward responds more strongly to the scents of familiar humans than it does to the scents of other humans, or even to those of familiar dogs. The journal Behavioural Processes published the results of the first brain-imaging study of dogs responding to biological odors. The research was led by Gregory Berns, director of Emory's Center for Neuropolicy. In 2012, Berns led the team that captured the first brain images of alert, unrestrained dogs, using harmless functional magnetic resonance imaging (fMRI), setting the stage for exploring the neural biology and cognitive processes of man’s best friend. 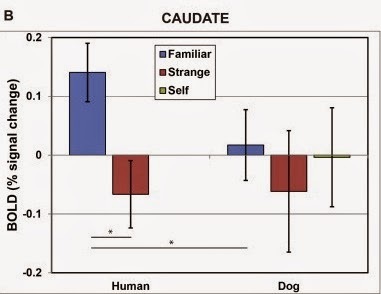 He has shown that dogs have a positive response in the caudate region of the brain when given a hand signal indicating they would receive a food treat, as compared to a different hand signal for “no treat.” In humans, the caudate region is associated with decision-making, motivation and processing emotions. Berns conducted the scent research with Andrew Brooks, also with Emory’s Center for Neuropolicy, and Mark Spivak, owner of Comprehensive Pet Therapy. “Olfaction is believed to be dogs’ most powerful and perhaps important sense, making it an obvious place to explore canine social cognition,” Spivak says. Kady, a lab involved in the study, shown training for the experiment in a mock-up scanner. Except for the dogs, apparently. The scent experiments were funded by the U.S. Department of Defense Office of Naval Research.